HomeUncategorized Electronics Recycling Should You Dismantle Your Electronics Before Recycling? Communities have learned the value of electronics recycling, especially when it comes to the disposal of outdated or broken electronics. Computers, tablets, smartphones, and other electronic devices contain a variety of valuable materials that can be used again and again if they are recycled correctly. Even though your first thought may be to dismantle your computer or other electronic devices so you get the maximum amount when you recycling it, there are several reasons why you should leave it intact and not hassle with the consequences. Computers and other electronic devices are extremely complex. To take an electronic device apart correctly so all of the pieces can be recycled would take you days, not hours. In the long run, it’s easier to spend your time removing and destroying any data you may have left behind and then taking your electronics to the nearest recycling center that takes these kinds of recyclables. When it comes to more intricate devices like tablets, smartphones, and game systems, special tools are needed to open the outer shell, and even then, special equipment must be used to ensure the parts aren’t damaged as they’re being removed. There are several ways you can remove stored information on your computer, such as reformatting and reinstalling the original operating system. This wipes the hardware clean and basically cleans out all of your information creating a blank slate for the next user. One of the biggest drawbacks of dismantling your own computers and other electronics is disposing of the parts. Many of the parts must be intact when they are turned in for recycling. This includes the motherboard and power system. By the time you finish breaking down your computer, for example, you would have many different types of materials that may have to be taken to different recycling centers. Wiring, motherboards, plastics, different metals, and glass would each have to go to a center that specializes in the recycling processes that are needed to re-purpose them. It’s much easier to take your electronics to an approved recycling center and let their team of professionals do the dismantling. The most important reason for not dismantling your own electronic devices has to do with the multitude of potential risks involved in the process. Even after days without power, a battery pack or power system may still hold a significant charge of electricity which could cause an injury if you don’t handle it correctly. There are also several toxic elements used in the creation of most electronic devices. Lead, beryllium, and mercury are often present. Even in small amounts, their toxicity can pose a significant health hazard. Some devices also contain components that can emit small amounts of radiation. While none of these are extremely hazardous on their own, a combination can lead to greater potential hazards. The minimal amount of money you will receive by taking your electronics apart for recycling isn’t worth the risk of being exposed to hazardous or toxic substances. 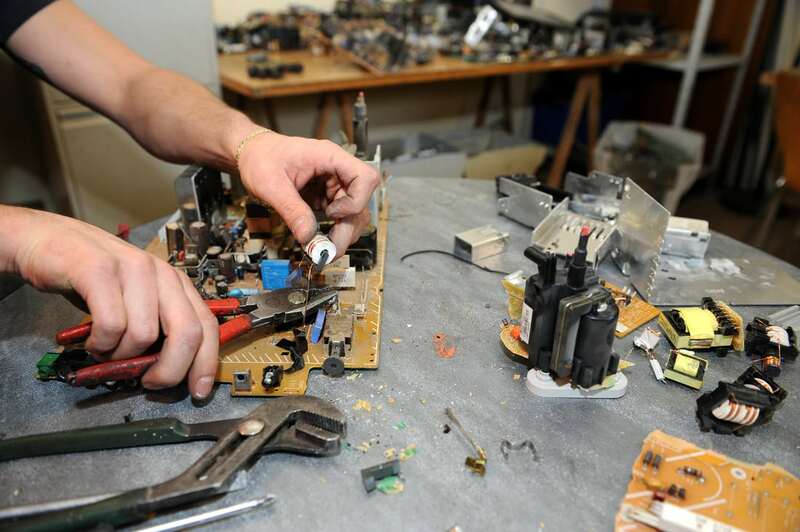 Centers that specialize in electronics recycling have the necessary tools and resources to protect their workers from any potential risks that may be present. Ewaste recycling centers are a great option for a wide variety of recyclable electronics and may even be willing to come to your place of business to facilitate the recycling process. Part of the reason for this is that they deal in bulk materials. A bulk pickup for an electronics recycling company can save your business time and money, when you take into consideration the time and effort you would have to go to dismantle each item properly, turning them in while they are still in one piece is a much more reasonable option.